Unlike other German brands, and even other Audis, the A5 comes rather well-equipped, with no need to add options. Most notably, you get real leather seats and that large glass roof, along with a three-zone climate system and a 10-speaker stereo with a CD player and Bluetooth. If you want heated seats, however, you'll have to pony up an additional $1,900 for the Premium Package, which also includes the bi-xenon headlamps with LED daytime running lamps that were first used on the R8 sports car. I'm not usually a fan of fancy headlights being offered as an extra-cost option, but these add quite a bit of style to the car's overall look. An S Line Package is available for $2,900 and includes a sport-tuned suspension (not the Audi Drive Select mentioned above), 19-inch wheels, different front and rear bumpers, sport seats, brushed-aluminum interior inlays, a sport steering wheel, headlamp washers and a black headliner. This equipment is similar to what the more expensive S5 comes with standard. If you just want 19-inch wheels, they cost an additional $900. The navigation system costs $2,390 and adds a six-disc CD changer. However, you must buy the Premium Package before getting the navigation system. Adaptive cruise control can be added for $2,100, as long as the car is already equipped with the navigation system. A Technology Package includes a rearview camera, adaptive headlights and a keyless start system for $2,200. And, yes, you have to get both the Premium Package and the navigation system to add it. Luckily, an upgraded Bang & Olufson 14-speaker sound system can be added to any A5 for $850, as can iPod integration for $290. The A5 starts at $40,700, but how much does a fully loaded one cost? $57,290. 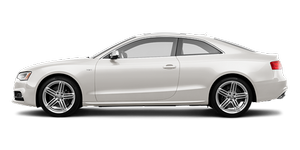 An almost-identically equipped S5 costs $61,890. So while the two cars' starting prices are more than $10,000 apart, when you load them up with goodies the difference is more than halved. And for just $4,000, the performance packed into a 354-hp S5 is definitely worth the extra cost.